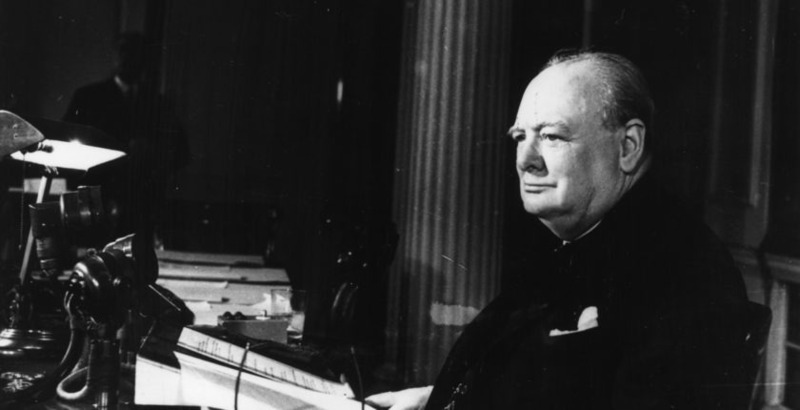 The worldwide media was exercised over the surfacing of what was alleged to be an unpublished Churchill article, held by the National Churchill Museum in Fulton, Missouri, in which our author contemplates the possibility of extraterrestrial life. The Museum, which received the typescript from the widow of Churchill’s literary agent Emery Reves, believed the manuscript to be a new discovery. A thoughtful appreciation of the article, and of Churchill’s remarkably scientific contemplation of the potential for alien life, was published in the scientific journal Nature by the Israeli-American astrophysicist Mario Livio, which we warmly recommend to readers. As much as we’d be pleased to find new Churchill material, however, the “Aliens” article is not new. Whole passages, as quoted by Dr. Livio in Nature, mark it as a variant of Churchill’s essay, “Are There Men on the Moon?” published by London’s Sunday Dispatch on 8 March 1942. In 1975 it reappeared in volume form in The Collected Essays of Sir Winston Churchill. Here briefly is the background of the article, as we piece it together from available records and sources. In the event, another version of “Are There Men on the Moon?” was never republished. In 1982, the typescript was donated to the Fulton Museum by Wendy Reves, where Dr. Livio found it. Publication of Livio’s excellent appreciation caught media attention, including that of the more sensationalist press, and away we went, on a viral exercise of keyboard clicks in search of Winston Churchill, who believed in aliens! Text from Michael Wolff, ed., The Collected Essays of Sir Winston Churchill, vol. 4, Churchill at Large (London: Library of Imperial History, 1975), IV 493-98. Reproduced courtesy of the Estate of Winston S. Churchill by permission of Curtis Brown Group Ltd. Does life exist elsewhere in the Universe?—indeed a fascinating question. All living things of the type we know require water, not only because some of them want it to drink or, in the case of marine animals, to live and swim in, but because every living unit, animal or vegetable, consists to a very considerable extent of this fluid. Now one cannot altogether rule out the possibility of a totally different world with oceans of some other liquid, such as petrol or, as some might perhaps prefer, alcohol, in which a weird and complex organic synthesis has brought into being units which one might call “living creatures.” But nothing in our present knowledge entitles us to make such an assumption. Of one thing, however, we can be certain, and that is that any entities formed in such surroundings would be totally unlike anything we know under the guise of living creatures or plants. Now, if we confine ourselves to the sort of things we know, and admit that water is a necessary ingredient of their life and being, we are restricted within comparatively narrow limits in the conditions in which such entities can exist. As we all know, if it is too hot water boils. Even the most meagre acquaintance with hygiene tells us that the best way to sterilize anything is to dip it in boiling water. On the other hand, if the surroundings are too cold, water freezes, and it is difficult to imagine that life could ever be formed in a world of ice and snow, even though creatures, developed from types which were produced in kinder surroundings, have managed to survive in arctic regions. Briefly, then, if life in the form we know it is to exist anywhere it can only be in regions of comparatively moderate temperature, say between a few degrees of frost and the boiling point of water. Obviously the stars are completely ruled out for this reason. For these consist of gigantic masses of incandescent gas in which every chemical compound is split up in its simplest components and in which the mere idea of life is an absurdity. But the sun, which is a comparatively insignificant star in the Milky Way—which is the name we give to our galaxy—is surrounded, as we know, by planets of which our world is one. On our earth life has developed. It has been able to do this because the temperature is neither too high nor too low. It is very easy to see what fixes the temperature of our earth. It is the temperature at which the heat falling upon it from the sun is equal to the heat which it radiates away into outer space. If it gained more than it lost it would get hotter, until the export of heat equalled the import, and vice versa. Mathematicians have an exact way of calculating this. But even without mathematics, it is clear that if the earth were further away from the sun it would receive less heat, and therefore that its temperature would be lower. From these considerations alone it is safe to rule out what are known as the outer planets—Jupiter, Saturn, Uranus, Neptune, and the recently discovered Pluto—as possible abodes of life. There remain Mars, Venus and Mercury. The mean temperature of Mars is well below the freezing point of water. It is a cold, arid planet with a climate somewhat like the top of Mount Everest would be if the sun were partly obscured, but with much less ice owing to a shortage of water. Life may exist there; indeed, the changes of colour in its spring and winter seem to indicate that some form of vegetation—be it only lichen—enlivens the faintly sunlit landscape. But the circumstances are harsh and forbidding, the atmosphere is thin and dry and short of oxygen, and there is little reason to suppose that any very highly organized forms are likely to have arisen. Venus, on the other hand, being nearer to the sun, is considerably warmer than we are. Apparently there is moisture in plenty, indeed, from our point of view, too much. For it is covered with a perpetual layer of cloud which prevents us seeing what the surface may be like. Though there does not seem to be much evidence of oxygen, it may be that in this hothouse atmosphere an elaborate flora and fauna exist, perhaps even intelligent beings. But unless they have developed some form of aeroplane which enables them to rise above the clouds, it is quite possible that if such intellectual creatures live there, they are quite unaware of the existence of an immense and complex universe of stars and nebulae outside their own world, and that they are living in the egocentric belief that they are the one and only habitation fit for reasoning beings. On Mercury, the innermost planet, it seems unlikely that life has arisen. Water would boil on the sunny side, while the face remote from the sun is so cold that most of the planet’s surface would be intolerable for any living entity we know. But what, it may be asked, of the moon?—our own satellite approximately the same distance from the sun as we are, and whose temperature therefore must be about the same as our own. This brings us to another condition which must be fulfilled if water and any sort of atmosphere are to persist. Any form of gas or vapour, as we know, consists of a lot of small particles, so-called molecules, flying about at high speeds, bumping into one another and against any solid or liquid with which they are in contact. The hotter the gas the faster they move; indeed, when we say that it is a hot day, what we really mean is that the molecules in the air are moving faster than usual. Now, it may seem strange that these molecules flying about in the outmost layers of the atmosphere do not simply shoot away into space; for, after all, there is no lid on the top of the atmosphere to stop them. The reason they do not is simply what we call the force of gravity. If you throw a stone into the air, the reason it falls down and does not go straight on is because it is pulled back by the earth. In the same way, a molecule at the top of the atmosphere does not fly away because the earth attracts it and it falls back again. Now, the moon is very much smaller than the earth, and the force with which it attracts anything is therefore less. A man who could throw a cricket ball a hundred yards on the earth could throw it six hundred on the moon. The molecules in the atmosphere, which find it impossible to escape from the earth, would readily fly away from the moon’s surface; indeed, such atmosphere as it may have had in the beginning has almost completely vanished. Thus the moon is an arid desert, almost entirely bereft of air or water, on which only the lowest forms of life can possibly exist. This argument applies, of course, even more strictly to the small fragmentary planets called the asteroids, a group of hundreds of little units ranging from about four hundred miles in diameter downwards which circle round the sun in orbits between that of the earth and Mars. Even the largest, with an area of some hundreds of millions of acres—which might at first sight appear to be an agreeable refuge in these unpleasant times, if only one could get there—is completely ruled out for any normal form of life by the smallness of the gravitational force which exists on its surface. On the smaller ones it would be possible to drive a golf ball right away into space; indeed, a man would run some risk if he jumped over an obstacle of flying away from his world altogether and himself becoming a planetoid circling round the sun. But, of course, nobody could live on such a tiny world, as no air or water could possibly remain on its surface, where the pull of gravity is so minute. In our own solar system, therefore, we can say fairly definitely that life of any complexity can exist outside our own earth only on Venus or Mars. But what about planets surrounding the other stars? The sun is merely one star in our galaxy, which contains several thousand millions of others. At first sight it might appear obvious that these others may be presumed to possess planets, which, if they happen to be at an appropriate distance and of the proper size, may be surrounded by atmospheres and be watered by rain as we are. This is probably true of a large number, though doubt has been cast upon it for a rather interesting reason. Astronomers for over a hundred years have been trying to account for the fact that there are all these planets surrounding the sun. They are all of them moving in much the same plane and in the same direction. Surely this should provide a clue. Now one of the explanations which has found great favour is that they were formed by the close approach to our sun of some vagrant star. This would attract gas on the surface and form a huge tidal wave which, if the star were sufficiently large and sufficiently close, might be dragged out of the sun and form a splutter of gas which would condense ultimately into a series of planets. Now, if this was the origin of the planets, it is possible to work out how near the vagrant star must have come, and it is found that the approach must have been very close indeed. But we know how many stars there are, how far they are apart, and how fast they move. One can work out, therefore, what the chances are of a close approach of this nature. Roughly speaking, if we made a model in which our world was the size of a grain of sand, the sun would be about the size of a golf ball, and its nearest neighbour would be represented by another golf ball about three hundred miles away. It is obvious that in such circumstances the chance of a clash is very small—so small, in fact, that it has been computed that only one such clash was likely to occur even amidst all our thousands of millions of stars in a thousand million years. If this is so, our sun may be indeed exceptional and possibly unique; no other star, or very few, would possess a family of planets, and a fortiori, no other planet would be the home of life. But this speculation depends upon the hypothesis that planets were formed in this way. Perhaps they were not. We know there are millions of double stars, and if they could be formed, why not planetary systems? Anyhow, many astronomers believe that all the stars were much closer together some few thousand million years ago, so that these close encounters would be more likely. In any event, I am not sufficiently conceited to think that my sun is the only one with a family of planets and, therefore, that our little earth is unique. Once we admit that the other stars probably also have planets, at any rate a goodly proportion of them, it is more than likely that a large fraction of these will be the right size to keep on their surface water and, possibly, an atmosphere of some sort; and, furthermore, at the proper distance from their parent sun, to maintain a suitable temperature. Do they house living creatures, or even plants? The answer to this question may never be known. It is conceivable that one day, possibly even in the not very distant future, it may be possible to travel to the moon, or even to Venus or Mars. The moon is only some 200,000 miles away, so that at a speed of 300 miles an hour it would only take three or four weeks to reach it; in interplanetary travel, if it comes at all, we must certainly reckon with far higher speeds than this, so that the time to reach the moon might be a matter of days rather than weeks. Venus and Mars are, of course, much farther away—some hundreds of times in fact—so that to reach them will probably be a matter of months at the very least, even if interplanetary travel proceeds at the rate of many thousands of miles an hour. Still, the possibility of one day exploring these planets cannot be excluded. It is rash to set limits to the progress of science. A man who had maintained at Queen Victoria’s Jubilee that within fifty years one would fly the Atlantic in a matter of hours would have risked being certified and locked up; yet we have seen this happen, and in the circumstances I am not prepared to rule out with any confidence the possibility one day of journeys through space in vessels carrying supplies of food and oxygen to the moon and the nearer planets. But even so, our chance of exploring the hypothetical planets surrounding other stars is so remote as to be negligible. The nearest star is so far away that even light, which travels at a speed of 186,000 miles a second, would take some five years to get there and back. Whatever one may think about the prospects of interplanetary travel, any speed of this order is quite out of the question. Even at a million miles a minute it would take some sixty years to visit merely our immediate neighbour. A young man starting off, if all went well, would return an octogenarian, and the odds are that our nearest neighbour might well lack suitable planets to support any flora or fauna of interest. The next stars are about twice as far away, the majority of the stars in our systems some thousands of times farther, so that any prospect of exploring them can be ruled out. But the Milky Way, our own private system of stars, enormous though it seems to us, containing as it does thousands of millions of suns, is but one unit among hundreds of thousands of other smaller so-called spiral nebulae rushing about in space. The nearest is several hundred thousand times as far away as the nearest star; the farthest which one has observed a thousand times farther. These distances are so gigantic that the possibility of ever discovering any detail about entities so far away need not be considered. Never will it be possible to ask a question and get a reply. If we could communicate by wireless it would take a million years for the answer to come back. Even if the Pharaohs had been able to send out a message we would by now only be able to receive an answer from the stars quite near the centre of our own galaxy. To get a reply from one of the distant nebulae, the message would have to have been sent before the first man walked upon the surface of our globe. When we see them we only know what they were like hundreds of thousands, indeed millions, of years ago, but the answer to the question whether they contain numerous suns possessing planets, and whether any of these support life, will always remain an enigma. All we can say is that with hundreds of thousands of nebulae, each containing thousands of millions of suns, the odds are enormous that there must be immense numbers which possess planets whose circumstances would not render life impossible. If we are sufficiently self-centred and choose to deny that any of these support life, no one can prove we are wrong. But I, for one, am not so immensely impressed by the success we are making of our civilization here that I am prepared to think we are the only spot in this immense universe which contains living, thinking creatures, or that we are the highest type of mental and physical development which has ever appeared in the vast compass of space and time.